The pacific decadal oscillation (PDO) is a mode of natural decadal climate variability, typically defined as the principal component of North Pacific sea surface temperature (SST) anomalies. To remove any global warming signal present in the data, the traditional definition specifies that monthly-mean, global-average SST anomalies are subtracted from the local anomalies. Differences in the warming rates over the globe and the PDO region may therefore be aliased into the PDO index. Here, we examine the possibility of a human component in the PDO, considering three different definitions. The implications of these definitions are explored using SSTs from both observations and simulations of historical and future climate, all projected onto (definition-dependent) observed PDO patterns. In the twenty first century scenarios, a systematic anthropogenic component is found in all three PDO indices. Under the first definition—in which no warming signal is removed—this component is so large that it is also statistically detectable in the observed PDO. Using the second/traditional definition, this component is also large, and arises primarily from the differential warming rates predicted in the North Pacific and over global oceans. Removing the spatial average SST signal in the PDO region (in the third definition) partially solves this problem, but a human signal persists because the predicted pattern of SST response to human forcing projects strongly onto the PDO pattern. This illustrates the importance of separating internally-generated and externally-forced components in the PDO, and suggests that caution should be exercised in using PDO indices for statistical removal of “natural variability” effects from observational datasets. Climate indices provide a means of distilling complex patterns of spatio-temporal variability into simple forms. Indices such as the southern oscillation index (SOI) or the pacific decadal oscillation index (PDO, Hare 1996; Zhang et al. 1997; Mantua et al. 1997), are often used to represent the behavior of modes of natural internal variability. Such modes of “unforced” variability share common features: they are thought to arise from interactions between the coupled atmosphere/ocean system; they display preferred spatial structures; and they can demonstrate sudden “regime shifts” and complex low-frequency behavior. Many of the features of observed modes of natural internal variability can be found in paleoclimate proxies and replicated by current climate models (Biondi et al. 2001; Hunt 2008; Pierce et al. 2000). The PDO index is associated with the interdecadal variability of sea surface temperatures (SSTs) in the northern Pacific Ocean. It is distinguished by abrupt phase shifts (e.g., in 1925, 1947, and 1977), and can have a “far field” influence on climate through atmospheric teleconnections (Mantua and Hare 2002). A large variety of natural systems (e.g., salmon productivity, drought-induced fires, annual river flow, onset of spring, etc.) and atmospheric variables have been related to “natural” fluctuations in the PDO (Mantua et al. 1997; Schoennagel et al. 2005; Neal et al. 2002; Cayan et al. 2001). Previous research studies have relied on PDO and El Niño indices to show that, over mountainous areas of the western US, climate variability alone cannot explain the declining snowpack, the decrease in the fraction of precipitation arriving as snow, and the earlier runoff from snowmelt (Mote 2003; Knowles et al. 2006; Stewart et al. 2005; Pierce et al. 2008; Bonfils et al. 2008). 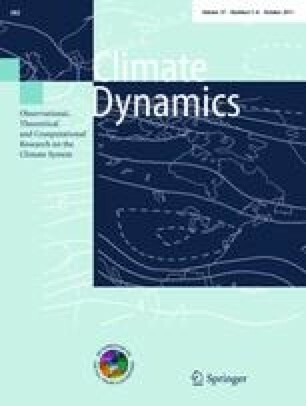 While knowledge of the current state of the PDO can be very valuable for seasonal and annual climate forecasts, for assessments of changes in natural systems (Mantua and Hare 2002; McCabe and Dettinger 2002) and for decadal climate predictions (Latif and Barnett 1996), the physical mechanisms responsible for low-frequency changes in the PDO are not yet fully understood (e.g., Nakamura et al. 1997; Trenberth and Hurrell 1994). Furthermore, it is entirely plausible that external forcings (e.g., greenhouse gas and sulfate aerosol forcing) have influenced both north Pacific SSTs and the PDO index itself. Meehl et al. (2009),1 for example, could only explain the prominent regime shift in Pacific SSTs in the mid-1970s by means of a combination of internally generated variability and anthropogenic forcing. To date, the PDO index has primarily been defined in two different ways. Under the first definition, the PDO is simply the first principal component of monthly SST anomalies in the Pacific Ocean poleward of 20ºN (e.g., Hunt 2008; Pierce et al. 2008; McCabe and Dettinger 2002; Sun and Wang 2006; Davis 1976). Under the second definition (the current “official” or “traditional” definition of the PDO; Zhang et al. 1997; Mantua and Hare 2002; Knowles et al. 2006), monthly-mean global-average SST anomalies are first removed from local anomalies prior to calculation of principal components. The rationale for this subtraction is to “separate this pattern of variability from any “global warming” signal that may be present in the data”.2 Since the true, underlying response of SSTs to human-caused changes in greenhouse gases is uncertain, Zhang et al. (1997) effectively assumed that observed changes in global-mean SST provided a reasonable estimate of this response. They also made a second, implicit assumption that the SST response to anthropogenic forcing is spatially uniform. We now know that this second assumption may be problematic (Meehl et al. 2007). Under the Zhang et al. (1997) PDO definition, if any long-term, systematic difference in the warming rates of global-mean SST and SST in the PDO region exists, it will be aliased into the PDO index. In this study, we investigate whether the PDO index contains a human signature. Our analysis considers both historical and projected future changes in SST in the PDO region. In the latter case, the imposed anthropogenic forcing is substantially larger than the estimated anthropogenic forcing over the twentieth century, thus making it easier to separate forced and unforced SST variability. We examine the behavior of the PDO using: (1) three different PDO definitions, (2) two recent observational SST datasets, (3) a suite of model simulations of twentieth and twenty-first century climate change, and (4) selected multi-century unforced control runs. This work relies on two recent observational SST datasets to estimate the spatial structure and temporal evolution of the PDO: the UK Meteorological Office Hadley Centre Sea Ice and SST dataset (HadISST1.1, Rayner et al. 2006), and version 3b of the extended reconstructed SST dataset (ERSST3b, Smith et al. 2008) developed at the National Climatic Data Center (see Appendix 1 for more information on the observational datasets). Both datasets show a similar slowly-evolving warming signal in the PDO region (Fig. 1). Using those two datasets allows us to test the robustness of results to structural uncertainties in the observations. These are uncertainties that arise from the sparse data coverage, the different reconstruction procedures used to infill missing SST data, and adjustments for non-climatic influences (such as changes in measurements practices, observational times, and instrumentation). PDO indices from model simulations of historical and future climate change are estimated using results from 17 different climate models in the CMIP-3 archive (Table 1). The set of 17 models analyzed here includes eight models (SELECT) that successfully capture key spatial and temporal characteristics of the PDO for the current climate (Overland and Wang 2007). Results from the multi-model CMIP-3 archive supply valuable information on structural uncertainties in both the applied twentieth and twenty-first century external forcings and the simulated climate response to these forcings. All twentieth century (20CEN) simulations include estimated historical changes in various types of anthropogenic forcing. Half of the 20CEN simulations (and seven of the eight SELECT models) also include some form of solar and volcanic forcing. The twenty-first century climate projections are based on the A2 scenario for future greenhouse gas and aerosol emissions. We also analyzed multi-century pre-industrial control (CTL) simulations performed with the SELECT models in order to estimate the sampling distribution of PDO trends arising from internal climate variability alone. Further details of the models and the SELECT models are provided in Appendix 2. The official PDO index (Mantua et al. 1997) is based on “residual” monthly-mean SST anomalies in the North Pacific region (poleward of 20ºN). The residual anomalies are obtained for each grid point and for each month by (1) removing the monthly climatology computed over the stipulated base period 1900–1993, and (2) subtracting the time-dependent global-mean SST anomaly for this particular month. The dominant EOF of these residuals, calculated over the 94 year base period, is described as the observed “spatial PDO pattern” (S-PDOP). The full PDO time series for the entire analysis period is then obtained by projecting the residual anomalies onto the eigenvectors of the S-PDOP (computed over 1900–1993). This procedure facilitates monthly updating of the PDO time series without modifying past PDO index values, and allows users to employ alternate observational SST datasets (see Appendix 3.1) using the original S-PDOP pattern. Here, we explore two alternatives to the “official” PDO definition (which we refer to as “definition 2”). Definition 1 is a simplified version of the official PDO index, which does not involve removal of a global-mean, monthly-mean SST signal prior to the EOF analysis. In definition 3, we subtract the regional-mean rather than the global-mean SST anomalies. The intent is to avoid aliasing differential warming rates over the North Pacific and the global oceans into the definition of the PDO. For each definition, we computed the leading EOF from the HadISST1.1 observed SST anomalies over 1900–1993, and thereby obtained three different spatial PDO patterns (S-PDOP1, S-PDOP2, and S-PDOP3). Observed SST anomalies for the entire analysis period (computed as specified under each definition) were then projected onto their corresponding S-PDOP, resulting in three observed PDO indices. Similarly, we projected the model SST anomalies (computed as specified in each definition) from the 20CEN, A2, and SELECT CTL integrations3 onto their respective observed S-PDOP (see Appendixes 3.1 and 3.2 for more details). The entire procedure is then repeated using the ERSST3b dataset. Since the phasing of the internally-generated component of the PDO is random in different realizations, the ensemble-averaging of SST anomalies over a sufficiently-large number of 20CEN and A2 realizations should help to reveal any underlying externally-forced component in the PDO. We first analyze the spatial characteristics of the three S-PDOPs obtained using the HadISST1.1 dataset (Fig. 2a–c). All three S-PDOPs capture the typical structural features of the spatial PDO pattern. A pool of anomalously cool water in the central North Pacific is surrounded by a horseshoe-shape region of anomalously warm waters (by convention, this is the positive phase of the PDO). The amplitude and the sign of the eigenvectors vary slightly with the index definition. This dominant mode explains ~27, 30, and 28% of the SST variance in the case of S-PDOP1, S-PDOP2 and S-PDOP3, respectively. The weighted spatial average of the eigenvectors is negative for S-PDOP1 and for S-PDOP2, but (by definition) is zero in the case of S-PDOP3 (Table 2). This information will be important for understanding the sign of projected PDO trends. We then analyzed the three observed PDO indices computed with HadISST1.1 data (Fig. 3a–b). All three indices show pronounced variability on multi-decadal timescales (Fig. 3a). As expected, the PDO2 (red) time series correlates best with the official PDO index (r = 0.93, Table 2).4 The PDO1 (black) index exhibits a negative trend (−0.86 ± 0.40°C/century) over the period 1900–2009 that is significantly different from zero (p = 0.04).5 This trend arises from projecting the slowly-evolving warming signal in the PDO region (shown in Fig. 1) onto the predominantly negative S-PDOP1. After subtracting the time-evolving global and regional mean SST changes (definitions 2 and 3), there is no overall statistically significant trend in either the PDO2 or PDO3 time series (Table 2). The difference between the PDO2 and PDO1 indices is large and displays a clear century-time-scale positive trend. The difference largely reflects the time-dependent globally-averaged SST anomalies subtracted in definition 2 (brown and blue dotted lines in Fig. 3b; r = 0.99). The “between-index” differences resulting from different index definitions are significantly larger than the differences attributable to observational SST uncertainties (defined as ± one temporal standard deviation of the difference time series between the HadISST1.1 and ERSST3b PDO3, and represented by the horizontal lines in Fig. 3b). Similarly, the differences between the PDO3 and PDO2 time-series are correlated with the differences between SST anomalies averaged over the PDO region and the global oceans (r = 0.76; magenta and blue dashed lines in Fig. 3b). When the PDO region warms more rapidly than the globe (during the period 1900–1955 and after the last PDO shift in 1977), the residual warming signal included in the definition 2-driven SST anomalies is projected onto the predominantly negative S-PDOP2, thus introducing differences between PDO2 and PDO3. 6 Between 1955 and 1975, this dissimilarity in global and regional temperatures decreases, as does the difference between the PDO2 and PDO3 indices. For the PDO2 and PDO3 index pair, the inter-definitional differences are smaller than the differences arising from observational uncertainties (i.e., the horizontal lines in Fig. 3b). All these results are qualitatively similar when using the ERSST3b dataset (see Appendix 4.1 and Table 2). We also note that for definitions 2 and 3, results are also insensitive to the base period chosen. In contrast, the trend in the PDO1 index is proportional to the spatial average of the S-PDOP1 eigenvectors, which varies highly with the base period employed (Appendix 4.1). As in the observations, the MME PDO1 index shows a century-scale negative trend over the period 1900–1999 (−0.36 ± 0.16°C/century, p = 0.03; black line in Fig. 3c). Another similarity with the observed results is that the difference between the simulated PDO2 and PDO1 indices displays a positive trend over the twentieth century and is highly correlated with the MME globally-averaged SST anomalies (brown and blue-dotted lines in Fig. 3d). This difference is larger than observational uncertainties (i.e., the horizontal lines). Finally, (and again as in the observed case), the difference time series between the simulated PDO2 and PDO3 time series correlates well with the differential warming of the PDO and the globe inferred from the MME (magenta and blue-dashed lines in Fig. 3d). In the A2 runs, greenhouse gas forcing is larger than over the twentieth century. The larger forcing more clearly reveals the effect of continued anthropogenic warming on the various definitions of the PDO (Fig. 3e–f). One striking result is that in the MME, all three PDO indices exhibit statistically significant century-scale negative trends over the twenty-first century (Fig. 3e). The origin of the trend differs for each index. In the case of the PDO1 index (black line), the significant negative trend (−6.12 ± 0.39°C/century, p < 0.001) arises mainly because the large anthropogenic warming in the northern Pacific Ocean simulated in the A2 runs is projected onto the predominantly negative S-PDOP1 (Fig. 4a). For the PDO2 index (red line), however, the negative trend (−2.00 ± 0.22°C/century, p < 0.001) results from the projection of a residual human-induced SST warming onto the predominantly negative S-PDOP2. This residual warming occurs because the ocean surface is predicted to warm more rapidly in the PDO region than globally (see Fig. 4a). This differential warming in the twenty-first century is a robust feature of model results (Fig. 4c). Even under definition 3 (green line), a negative, statistically-significant trend in the PDO3 index persists (−1.18 ± 0.20°C/century, p < 0.01). This negative trend occurs because the pattern of SST response in the A2 runs is similar to the PDO3 pattern (and thus projects strongly onto the latter), but the forced SST response to combined greenhouse-gas and sulfate aerosol forcing is of opposite sign to the PDO3 pattern in the central “core” of the PDO region (compare Figs. 2c, 4a). Finally, we note that both of the “between-definition” differences (PDO2 minus PDO1, and PDO3 minus PDO2) are predicted to be larger than the current observational uncertainties. The behavior of the PDO in the twenty-first century simulations is relatively insensitive to observational uncertainties in the S-PDOP patterns, or to the set of models chosen for analysis (see Appendix 4.2 and Table 3). Can the historical PDO trends (in model and observations) and future PDO trends (in the A2 runs) be explained by climate noise alone? To address this question, we compared the century time-scale PDO changes in the observations and in the historical and future simulations with the unforced changes in the PDO estimated from the model control runs. To perform these comparisons, we computed the distribution of PDO trends; 1) over 1900–1999 (from the 20CEN runs); 2) over 2000–2099 (from the A2 runs); and 3) from overlapping 100-year segments of the CTL integrations. We then estimated whether (1) the observed PDO trends could be due to climate noise alone; and (2) the distributions of PDO trends inferred from the 20CEN (or A2) runs differ from the distribution of unforced trends. This analysis was performed independently for each definition, using the SELECT models only (Fig. 5). Further details regarding the trend comparisons are provided in Appendices 5.1 and 5.2. In the case of definition 1 of the PDO (Fig. 5, left panels), we found that both the HadISST1.1 and NOAA3b PDO1 trends are incompatible with changes arising from climate noise alone (at the 5% level for HadISST1.1 and 10% level for NOAA3b), but consistent with PDO1 trends obtained from the 20CEN runs. The distributions of 20CEN and A2 PDO1 trends are statistically different from the distribution of unforced PDO trends (at the 5% significance level). These results suggest that an externally-forced component is detectable in the observed PDO1. For definitions 2 and 3, the PDO trends projected to occur over the twenty-first century in the A2 scenario cannot be explained by climate noise alone, and are likely to contain an anthropogenic component. However, historical trends in the simulated and observed PDO2 and PDO3 indices over the twentieth century were not inconsistent with model-based estimates of internal noise. Because of the increase in anthropogenic forcing in the second half of the end of the twentieth century, we repeated this analysis for a 32-year period starting after the last observed PDO shift of 1977. For this more recent period, all observed PDO trends over 1978–2009 can be distinguished from internally-generated variability, independent of the PDO definition employed (at the 5% level for definition 1 and at the 10% level for definitions 2 and 3). We note that on the 32-year timescale, the more rapid warming of the PDO region (relative to the globe) is evident in the observations, in two-thirds of the 33 20CEN realizations, and in all but one of the A2 realizations (Fig. 6). We have shown that the interpretation of changes in the PDO index can be problematic. If no global-mean SST signal is subtracted prior to the EOF analysis (our definition 1), the PDO index is contaminated with a significant anthropogenically-forced component. This component is detectable (on the century time scale) in both observed SST datasets examined here. It is also detectable in model simulations of historical and future climate change. It is unlikely, therefore, that the behavior of the observed PDO1 index is entirely due to natural internal variability. The official definition of the PDO (our “definition 2”) makes the implicit assumption that any anthropogenic influence on PDO behavior is completely removed by subtracting the time-evolving changes in global-mean SST from local SST changes in the PDO region. This is unlikely to be the case. Differences in warming rates appear towards the end of the twentieth century in two-thirds of the 20CEN runs, with the PDO region warming more rapidly than the global oceans. In the A2 simulations, these differences in warming rates are large and occur in almost all models, yielding twenty-first century PDO2 trends that are clearly distinguishable from internal climate variability. Our results suggest, therefore, that a residual anthropogenic signal is aliased into definition 2 of the PDO. Detection of this signal in the observed PDO2 indices depends on the timescale of the analysis: observed PDO2 changes over the full twentieth century are not significantly different from model-based noise estimates, but PDO2 changes over the last 32 years cannot be explained by internal variability alone. If model projections of future SST changes are reliable, anthropogenic contamination of the officially-defined PDO index should become more apparent over the next several decades, as the differential warming of the North Pacific and global oceans continues. Subtracting the time-evolving changes in “PDO-average” SSTs from the local SST changes prior to the EOF analysis (our definition 3) partially solves this “contamination” problem. The anthropogenic component in the PDO3 index is much smaller in the case of the PDO1 and PDO2 indices. In the PDO3 index, this component arises because the pattern of SST response to greenhouse gas forcings is similar to the PDO3 pattern (and thus projects strongly onto the latter), but the SST changes in these two patterns are of opposite sign in the central “core” of the PDO region (compare Figs. 2c, 4a). The resultant negative trend in the PDO3 index is only conclusively distinguishable from internal climate variability in the A2-based PDO3 time-series. Even in the case of the PDO3 index, therefore, where the index is unaffected by differences between regional and global warming rates, there is a very real possibility that human activity may influences the statistical properties of “natural” modes of variability (see, e.g., Corti et al. 1999; Fedorov and Philander 2000; Shindell et al. 1999; Timmermann et al. 1999; Cubash et al. 2001; Palmer 2008). Our results support previous research (Overland and Wang 2007) suggesting that the variability in North Pacific SST will be dominated by a warming trend rather than by PDO variability. As noted above, we also find (in our analysis of the A2 results) that this overall warming of the North Pacific is likely to have some spatial structure, with maximum warming in the central North Pacific. Our study illustrates that North Pacific SST changes over the twentieth and twenty-first centuries have both internally-generated and externally-forced components, and that the strength of these components is dependent on the definition of the PDO index. Understanding both internal and external components is important in order to improve the decadal predictability of future changes in regional climate, droughts, and natural systems. Since PDO indices are often used to statistically remove “natural variability” effects from a variety of observational datasets, such noise removal exercises should be exercised with great care. We focus in this paper on the PDO index, and hence on North Pacific SSTs. Other studies (such as Meehl et al. 2009) have devoted their attention to the Interdecadal Pacific Oscillation (IPO, Power et al. 1999; Meehl and Hu 2006; McGregor et al. 2007), which is defined as the first EOF of detrended SSTs for the entire Pacific basin (or the second EOF of the non-detrended Pacific SST data). The behavior of PDO and IPO indices is closely related. This quote is taken from the current official PDO website: http://jisao.washington.edu/pdo/PDO.latest. SST anomalies from A2 simulations have been defined relative to the monthly-mean climatology over the period January 2000–December 2009. The climatology used for anomaly definition in the CTL runs was calculated over the first 10 years of the integrations. These two time series are not exactly identical owing to small differences in the datasets and processing options (see Appendix 3.1). The PDO1 index is predominantly in the cold phase at the end of the record. This occurs because the time series have been plotted relative to the period 1900–1909. By definition, this residual warming is not included in the definition-3 driven SST anomalies. . In theory, trends in a natural mode of variability should (with a large enough number of realizations) produce a sampling distribution with an average trend of zero. We thank the international modeling groups for providing their data for the analysis, the Program for Climate Model Diagnosis and Intercomparison for collecting and archiving them, and the World Climate Research Program’s Working Group on Coupled Modeling for organizing the model data analysis activity. We warmly thank David Pierce and Tim Barnett for their helpful comments, notably for the origin of the inter-definition differences. This work was performed under the auspices of the U.S. Department of Energy by Lawrence Livermore National Laboratory under Contract DOE-AC52-07NA27344. A portion of this study was supported by the US Department of Energy, Office of Biological and Environment Research. The HadISST1.1 (ERSTT3b) observational dataset is provided in the form of monthly mean data, spanning from January 1870 (1854) to December 2009 on a 1º × 1º (2º × 2º) latitude/longitude grid. Reconstruction of SST anomalies involved a fitting to a set of spatial modes in ERSST3b dataset, and a two-stage reduced-space optimal interpolation procedure in the HadISST1.1 dataset. For both datasets, the land-sea mask is binary and ocean temperatures covered by sea-ice have been set to −1.8°C before regridding (See Appendix 3.2). The sea-ice mask provided in HadISST1.1 is time-dependant. This analysis relies on Coupled Model Intercomparison Project phase 3 (CMIP3) simulations performed for the Fourth Assessment Report of the Intergovernmental Panel for Climate Change (IPCC AR4). These simulations were made available to the scientific community through the U.S. Department of Energy’s Program for Climate Model Diagnosis and Intercomparison (PCMDI) at Lawrence Livermore National Laboratory (http://www-pcmdi.llnl.gov). In this study, we selected a total of 17 different climate models that have been used to perform both 20CEN and A2 experiments (in IPCC terminology, these integrations are referred as “20c3m” and “sresa2”, respectively). Multi 20CEN (A2) realizations exist for 11 (7) of the 17 models analyzed here. The realizations from a particular ensemble contain identical changes in external forcings but differ only in their initial conditions. This approach yields many different realizations of the climate “signal” (the response to the imposed forcing changes) plus climate noise. The number of realizations and the name of modeling group are provided for each model in Table 1. The eight SELECT models are CCCma-CGCM3.1 (T47), GFDL-CM2.0, GFDL-CM2.1, MIROC3.2(medres), MIUB/ECHO-G, MRI-CGCM2.3.2, CCSM3.0 and UKMO-HadCM3). Different performance tests (Latif and Barnett 1996; Nakamura et al. 1997; Sun and Wang 2006) could have led to a slightly different set of selected models. More details on the external forcings used in the 20CEN experiments are provided in Santer et al. (2006). The official PDO time-series relies on “residual” monthly-mean SST anomalies in the North Pacific region, poleward to 20ºN. The PDO region of consideration in this study extends from 20ºN to 60ºN and from 245ºW to 115ºW. The calculation of the PDO indices requires a three-step approach. Step 1 includes regridding and masking appropriately all data (see Appendix 3.2). Step 2 consists in an EOF analysis to obtain the S-PDOP pattern. This EOF analysis accounts for the smaller area weight of the northern latitudes (due to converging meridians) by weighting the gridded SSTs by the square root of the cosine of the latitude. The last step involves the projection of SST anomalies from the various observational datasets and climate model simulations onto this S-PDOP. Steps 2 and 3 are reiterated for each definition. This procedure closely mimics the official methodology, which relies on one unique S-PDOP (based on the period 1900–1993) and allows for a monthly update of the PDO time-series and possible changes in employed observational SST datasets, without the modification of past PDO index values. For instance, the official PDO index has been derived from an older version of the HadISST1.1 dataset for the period 1900–2002, but extended after 2002 using the optimally interpolated SSTs dataset (Reynolds and Smith 1995). We can also note that this technique permits to obtain PDO indices from all simulations, independently of their ability to successfully capture the spatial characteristics associated with PDO. The question of whether the PDO would have a different pattern in the twenty-first century is however not addressed here. The analysis and interpretation of the spatial PDO pattern obtained from individual IPCC models projections are discussed elsewhere (Bond et al. 2006). Each observational and model dataset is provided with a land-sea mask on its original grid. The projection of the variety of simulated and observational SST anomalies onto common observed S-PDOP patterns requires that all data share the same horizontal grid and a common land-sea mask. We followed the following strategy: (1) we regridded data from all observational datasets and model experiments to a common T42 horizontal resolution, in taking appropriately the mask into account, (2) additionally, in order to mimic the observational datasets, all regridded SSTs inferior to the threshold of −1.8°C in the climate simulations have been given the −1.8°C value to represent sea-ice. In the case of HadISST1.1, the time-dependant sea-ice mask has been regridded first, then this time-dependant sea-ice mask has been geometrically averaged along the time-axis to provide a time-independent sea-ice mask, (3) to obtain a final land-sea mask common to all datasets, all regridded masks have been averaged geometrically. The final mask excludes any gridpoint that is covered entirely by land in at least one dataset. Here, we investigated the stability of the S-PDOP pattern over time using the dataset with the longest record (ERSST3b). For each definition, we determined S-PDOP using 12 different overlapping 50 years base periods (1860–1909, 1870–1919, 1960–2009 and the additional 1900–1993 period). Figure 7a displays the spatial pattern correlations obtained with the first base period (1860–1909). S-PDOP3 and S-PDOP2 are the least sensitive to the base period used. In contrast, the spatial variability in the S-PDOP is the most pronounced when definition 1 is used. Figure 7b shows that the trend in ERSST3b-based PDO1 over the period 1900–2009 varies greatly with the base period chosen. It also shows that the trend is proportional to the spatial average of the corresponding S-PDOP1 eigenvectors. This indicates the large influence of projecting a slowly-evolving warming onto an unstable S-PDOP1 pattern. Likewise, the trends in projected future PDO time-series are sensitive to the base period in definition 1 and relatively insensitive to the base period in definition 3 (not shown). The results presented in the main manuscript are inferred from the eight SELECT climate models. Each model has been given the same weight, independently of its number of realizations. We tested the sensitivity of the results using two sets of models (using either the 8 SELECT models or the total of 17 models), and two model weighting options (equally-weighted, or weighted as a function of the number of realizations). We found that the results are not very sensitive to those processing options (Table 3), with one exception: when all models are used, the negative 20CEN trends in PDO1 are not statistically significant. The model-derived estimate of the two-tailed 95% (90%) confidence interval natural internal variability is calculated as 1.960 (1.644) × sE, where sE is the standard error of the sampling distribution of the unforced trends. We consider that an observed trend is inconsistent with the simulated response to internal climate variability at the 5% (10%) level when its estimate exceeds this 95% (90%) confidence interval. We use a Kolmogorov–Smirnov (KS) test to determine whether the trend distributions inferred from the 20CEN (or A2) and CTL experiments differ significantly (Press et al. 1992). The KS test consists at comparing the cumulative distribution A(x) of the 20CEN (or A2) trends with the distribution C(x) of the CTL unforced trends. For the differential warming between the PDO and global domains, we test the null hypothesis that A(x) ≥ C(x). For the PDO time-series themselves, the null hypothesis is that A(x) ≤ C(x). We compute the maximum distance between C(x) and A(x) and the associated one-tailed p-value.